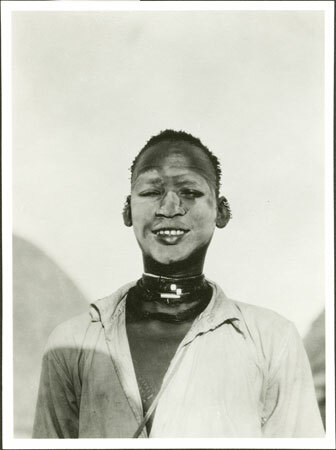 A head and shoulders full face portrait of a male youth (identified as Nhial) wearing a white shirt and numerous string neck ornaments, with ash smeared on his face and numerous earrings. Nhial first joined Evans-Pritchard in 1930 as he struggled to establish his first fieldwork base, and travelled with him to Muot Dit for work among the Lou. He is also known to have met up with Evans-Pritchard again in 1931 when this image was probably taken. Nhial was again employed by Evans-Pritchard in 1936, when Evans-Pritchard spent five out of seven weeks fieldwork at Nhial's home village of Nyueny. Note on print reverse ms pencil - "09 12"
Morton, Chris. "Nuer youth with ash face decoration" Southern Sudan Project (in development). 03 Jan. 2006. Pitt Rivers Museum. <http://southernsudan.prm.ox.ac.uk/details/1998.346.12.2/>.